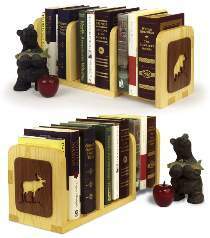 This book rack accordions in or out to hold one or many books upright. Make it from 1/4" and 3/4" stock. Plan includes patterns for moose, bear, eagle and fish. End panels are made by edge gluing 1/4" thick x 3" wide walnut to form 5" x 6" panels. Patterns drawn FULL SIZE. Order one piece of walnut for end panels separately.